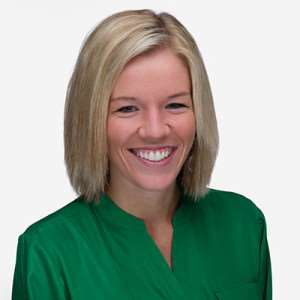 Disclosure: This post is sponsored by Gorilla Glue. All opinions, images and love of DIY projects are 100% mine. It’s almost St. Patrick’s Day! Which you know is just one of my favorite holidays. I mean there’s green everywhere! It’s perfect. I just put together this fun little cork shamrock to add a festive touch to our house. Isn’t it cute!? 1. 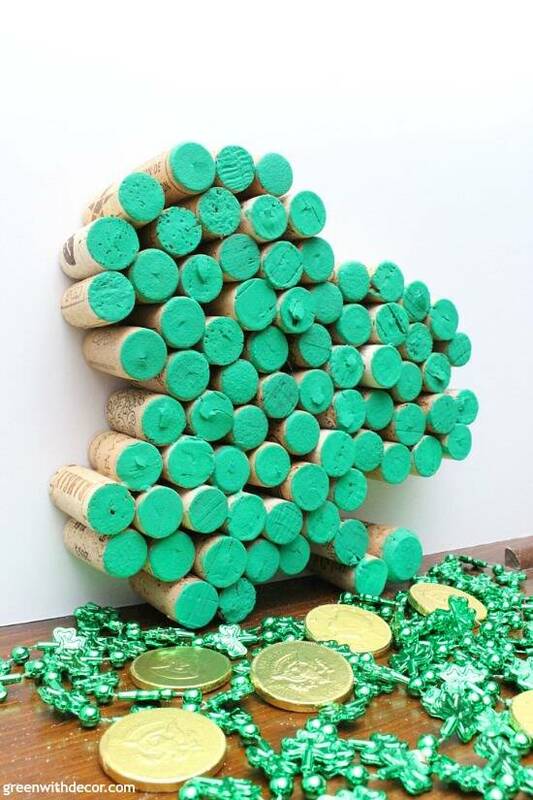 Line up your corks into a shamrock shape. It might help to pull up a picture of an actual shamrock and kind of mimic it so you get the leaf shape. 2. Glue your corks together. Start by gluing the corks from one leaf together, then a second leaf, then glue those together and build the third leaf off of that. Glue on the stem last. I used Gorilla Glue’s Clear Grip, which is awesome. It’s strong. The bond forms pretty quickly (as in almost immediately) so be sure to line up your corks exactly where you want them before pressing them together, because it’s hard to move them after the fact. For an even stronger bond, apply the Clear Grip to a cork, let it (partially) dry for about 2 minutes and then join the two corks together. I love that with Clear Grip, you don’t have to worry about burning your fingers with hot glue (which I’ve definitely done with other cork projects). Let the Clear Grip dry for 24 hours before you move or paint your cork shamrock. I painted just the cork tops (with this green paint) and kept the natural look of the corks on the sides. I like the contrast. I did just one coat, and the coverage was great. If you want to paint the whole thing, Clear Grip is paintable so you don’t have to worry about the paint clumping or not sticking. Let it dry, and then display! That Target Dollar Spot gets me just about every time, but how fun are those beaded shamrock necklaces? And gold coins, because of course. 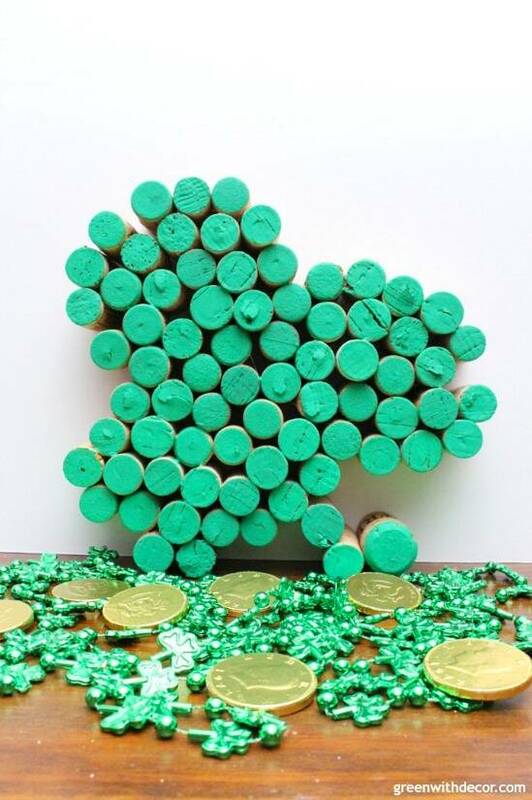 Have you done any St. Patrick’s Day crafting yet this year? Sense a theme? I’m all about repurposing things you’d probably otherwise throw away for easy St. Patrick’s Day crafts! I loooove me some wine cork crafts! Cute idea! Oh my gosh- this shamrock is so cute and creative! Thanks for sharing!